Note: We are not talking about the Table Of Contents Web Part here. 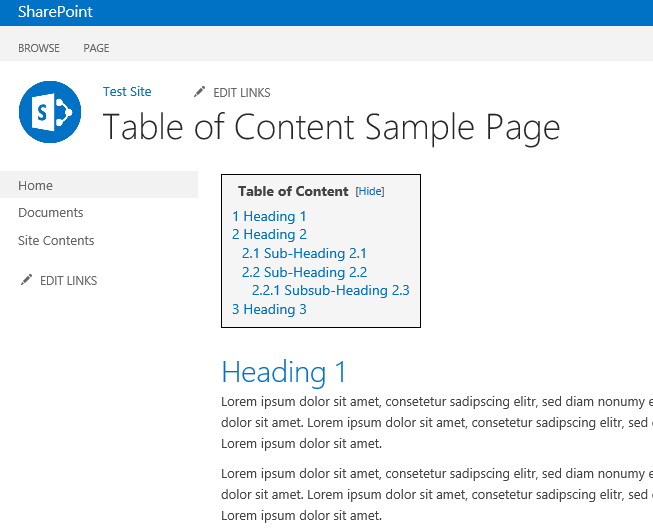 We are talking about a table of page content, a table which get's all the headings of a single page and generates a Table of Content. You can use following code for Article Pages, Publishing Pages, etc. Herefore, insert a Content Editor Webpart and point the "Content Link" to your newly created html code file. Set "Chrome Type" to None. Save the page - Done! This is a more complicated approach. In Enterprise Wiki Pages you have this Basic Page Layout with a sidebar which shows you page rating and categories. 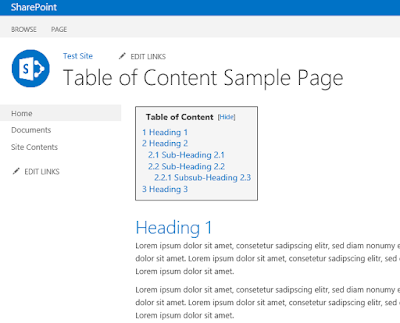 With following solution, you'll be able to place a Table of Content inside this sidebar. This solution makes use of 4 files (+ Jquery). Now you have two possibilities. B) You create a new Page Layout which contains those references. Edit 13.06.2018: A reader asked, what to do if your ToC would become too long (bc of too many headings). In this case you have to forgo the sticky part, otherwise the last few headings/links would be outside of your screen. So in this case, simply leave the sp.tableOfContentsSticky.js out.